MessyJesse - a quilt blog by Jessie Fincham: She Greets The Day! Giveaway! She Greets The Day! Giveaway! 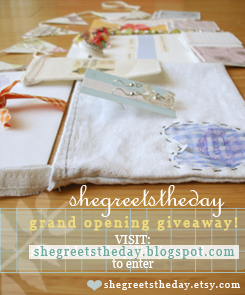 Lovely giveaway by creater, she greets the day! i have just discovered Jane's delightful blog and noticed she is having a giveaway with an item from her etsy shop.